Is your job as hard as you want it to be? First: a Veterans/Remembrance Day moment of appreciation to all military veterans out there. The rest of us will never actually understand the level of service and sacrifice that you made. Thank you, truly. Now, some of that leadertainment you came here for. Many people find themselves restless at work, struggling to find balance. If you are, like me, a modern day corporate Goldilocks seeking professional balance that is “just right,” perhaps this framework will be helpful to you. This is not what I meant by “hard.” Entertaining, though, on a few levels. What I’m proposing is that a job can be hard on you physically, mentally, both, or neither. Ok, I won’t wait up late for the Nobel phone call, but perhaps you haven’t taken stock of your job this way before, or thought of ways to change the balance. Why is your job hard? Once you’ve placed your current job on the matrix, ask whether the role fits what you want from your career at this stage. Maybe your commitments at home are growing and you’d happily take on some career Atrophy for more bath time with the kids and date nights with your spouse, or the flexibility to start volunteering. At the other end of the scale, perhaps you are a recent empty nester and are ready for the Exhaustion of a tough growth challenge with a startup organization. 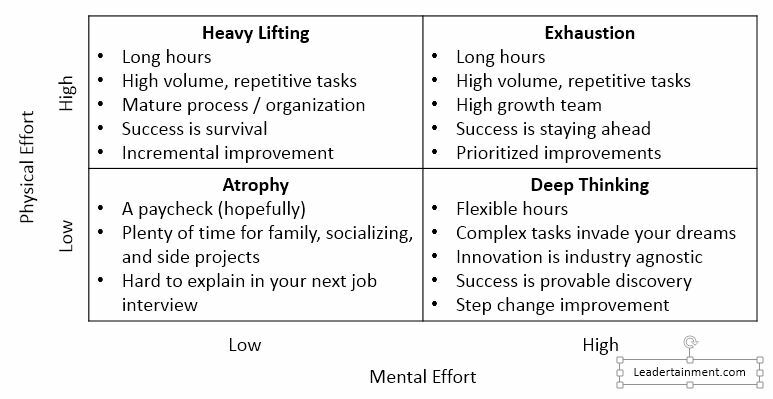 Many of us are very happy with Heavy Lifting or Deep Thinking roles, once have found the right match for our strengths. In an upcoming post, we’ll dive in to the concept of purpose at work. For now, think about why your job is hard, and whether you are satisfied with the answer. If not, collect your thoughts and reach out to your manager, your peers, and your team, and make a plan to change it for the better.